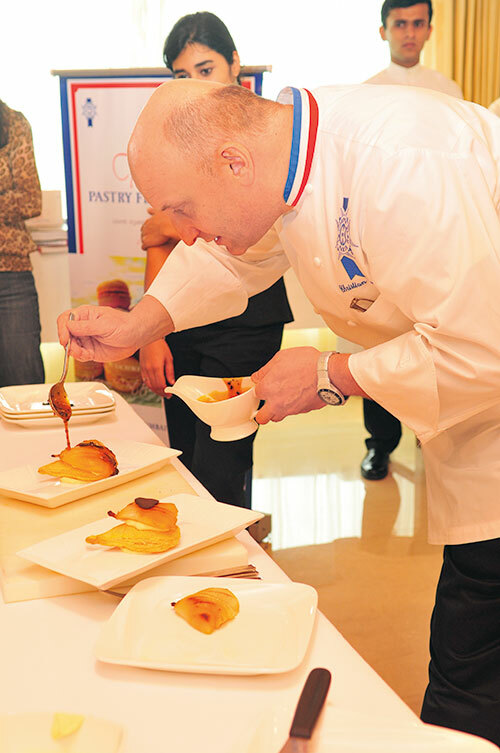 Bringing the concept of the gastronomic dessert to India was Chef Christian Faure, pastry instructor and director of operations, Le Cordon Bleu, that ultimate school of French cuisine. And, oh yes, the bald-headed chef with the merry glint in his eye has been awarded Pastry Chef of the Year 2010 by the Canadian Culinary Federation, a title that he has been presented with, off and on, by other gastronomy groups as well. The highlight of awards perhaps was in 1997 when he received the title of M.O.F (Master Craftsman of France). No wonder then that he is excited about the fact that the French traditional meal has been added to the UNESCO World Heritage list. Someone out there is thinking with their stomachs! Today, at The Oberoi, Mumbai, he is flexing his imagination and considerable dexterity around a dessert that does what gastronomy is supposed to do – surprise. 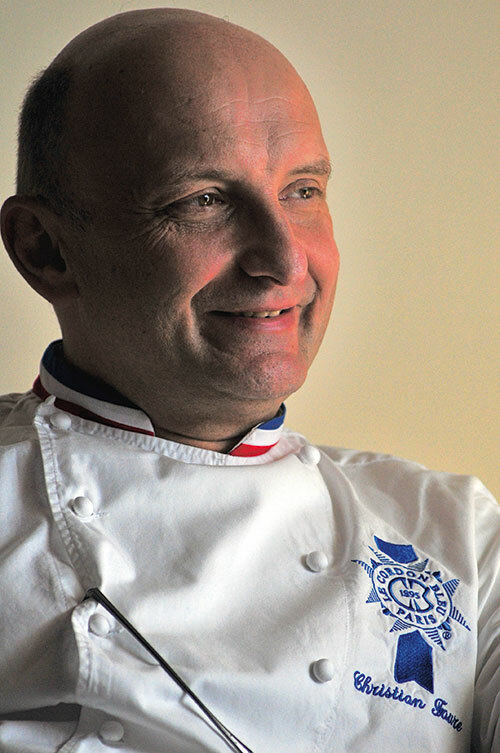 “The point of making gastronomic pastry is to make something rare,” he says. The Pear Feuillantine with truffle flavoured caramel sauce unusually adds that elusive fungus, the truffle, used sparingly in haute cuisine, to a dessert. Surprised? A finger of pear-shaped, newly baked puff pastry is topped by a fan of poached pear from the Mumbai marketplace, dotted with pastry cream, drizzled with caramel sauce and topped with whipped cream; served warm with a scoop of vanilla ice cream. A tentative mouthful reveals a burst of unusual flavours – a blend of warm and cold, sweet and the almost-bitter. And those shavings of aromatic truffle? They sit proudly on the sweet plate, lending unexpected texture and flavour! So, he lives in Canada, but Faure is a Frenchman after all. And where the French are, there will surely be romance. Here, the romance of inventive flavours, the romance of discovery on an expectant palate and the romance of desserts the way only the French can make them…. Portions of an interview with the king of sweet things…. A dessert for his loved one…. 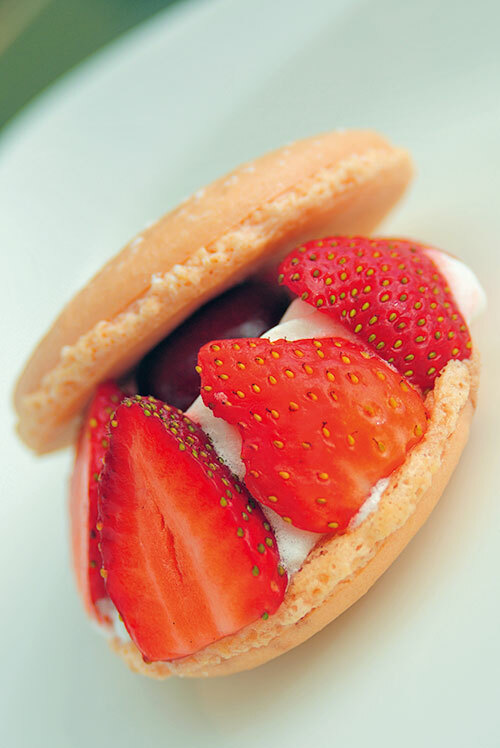 St Valentine symbolises love for one person and so I would make a very special dessert for the occasion. When you are in love, you have fire in the heart and that can be denoted by the colour red. So I will take the fruit of love – could be some heart-shaped strawberries or passion fruit, so named since it is harvested during the Passion of Christ. But, I will go with the apple because the apple takes you back to Adam and Eve. I will cover the apple in spun sugar – the form is smooth and pleasing to the eye, like your fiancé – simple but beautiful. Now, we need to add something that will raise the emotion, something soft and melting like the heart. Perhaps a very light sabayon. Imagine that shiny red apple on a plate. How do you eat it? Just like you are unsure about your fiancée, she is unsure. Then, she hits it and discovers the softness inside…. 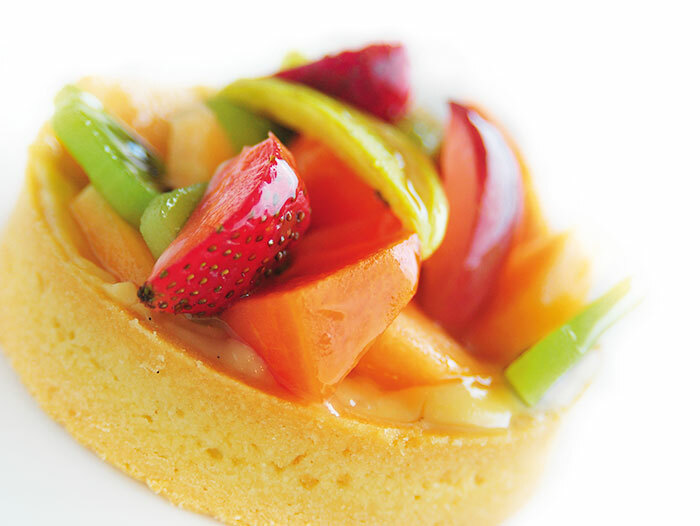 The dessert above all is an emotion – something that must be thought about. And yet, the best desserts are often the simplest. There is nothing more beautiful than a child saying, ‘I love you, Mum.’ The love we want to give is automatically translated into the pastry we make. The best-tasting dessert in the world is the chocolate cake made by a mother for her child. The best dish could be the pizza that you are sharing with the girl you love. The best memory of food is your wedding cake which is white in colour and stands for purity rather than virginity. In all civilisations, we celebrate by giving and receiving pastry. During your entire lifetime, your love will be accompanied by pastry. Most of my life I worked in royal palaces. Remember, celebrities are like normal people. They are created by media and press. They have their joys and happiness like everyone else and life does not spare them their miseries. I have done a lot of celebrity celebrations but have received a great deal of affection and appreciation from Tina Turner. She is someone who has a big heart, a heart of gold. When she is present, she gives of herself completely. I remember receiving a phone call from her, ‘Christian, make me a birthday cake! If Christian does not make me a cake, I will not celebrate my birthday!’ I had however changed hotels at that time and the management had to borrow me for this occasion. She had a lot of ideas, but to translate those into reality is the work of the chef. Finally we did a mounted piece of interlocking rings of savarin pastry. She was very happy. 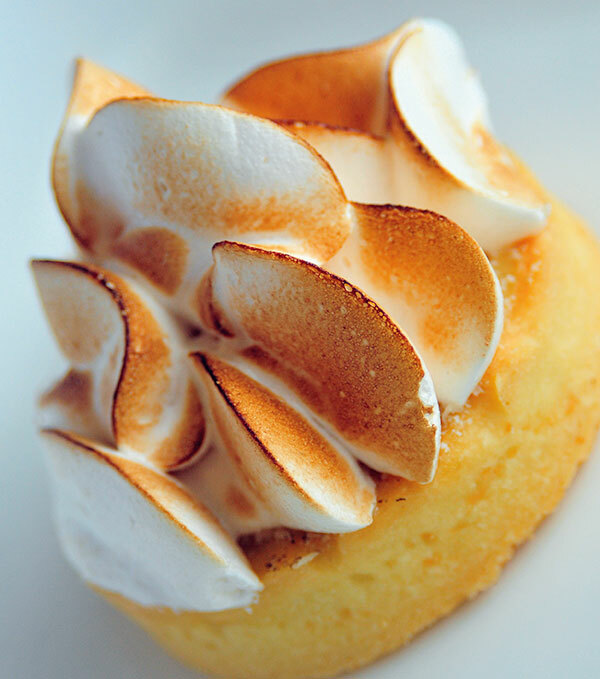 On the excellence of French pastry…. France does not have a monopoly on pastry but the country has a historic background and rich culinary tradition as compared to the US. At the Chateau de Versailles, were held banquets for more than 250 guests while the Americans were on horses conquering the world. France has also profited from historical events like the Crusades. Jerusalem has enriched their gastronomic heritage. Nougat, for instance was originally from Syria but the French took it up. Everywhere they went, the French thought of their stomachs and enriched their culture. The idea of being gastronomic is to surprise…. For instance, with molecular cuisine, the main idea was to surprise people. Its only ambition was to be fashionable. And yet, it ended while still at the top of its popularity. Why? Because it was being copied – there were too many bad copies…. It is important to create something and after that, you create something else. The main idea of being a master chef is that you keep creating. You take from the past and reach into the future…. I tried some Indian sweets on my trip to India since it does not make any sense to go to a culture and not taste it. Sometimes, you may not like what you taste. What I would love to do is go to an old heritage palace in India with my fiancé and create a dessert in that historic setting. Why? Because that will give me a memory and my best creations are inspired by love. Puff pastry: Flour, 300 gms; Salt, 6 gms; Melted butter, 50 gms; Water, 150 ml; Butter for tourage, 200 gms. Poached pears: Pears, 3 nos; Sugar syrup – Sugar, 300gms; Water, 1 ltr. Pastry cream: Milk, 500ml; Vanilla bean, 1 pod; Egg yolks, 4 nos; Sugar, 125 gms; Flour, 30 gms; Cornstarch, 30 gms. Truffle flavoured caramel sauce: Sugar, 100 gms; Glucose, 20 gms; Whipping cream, 120 ml; Truffles, cut into brunoise. Creamy vanilla ice-cream: Milk, 400 ml; Powdered milk, 13 gms; Egg yolks, 50 gms; Sugar, 90 gms; Trimoline (inverted sugar), 20 gms; Stabliser, 1.5 gms; Vanilla bean, 1 pod; Whipping cream (35 per cent fat) 70 ml. Crispy tuile: Bananas, 100 gms; Flour, 70 gms. Puff pastry: Make a classic puff pastry with 6 turns, Chill until needed. Roll out pastry and cut out pear shapes. Bake in preheated oven at 170˚C for 20-30 minutes. Poached pears: Poach the peeled pears in sugar syrup after brushing with lemon juice; drain and cool. Slice and pan vertical halves of the pears. Sprinkle pears with sugar and caramelise in a pan. Pastry cream: Boil milk and vanilla bean pod in a heavy base saucepan. Set aside. Beat egg yolks and sugar together in a heatproof bowl. Whisk in flour and cornstarch. Whisk in the milk after removing the vanilla bean pod into the mixture and return to the saucepan. Bring to a boil over medium heat, whisking constantly. Simmer 1 minute. Remove from heat and spread the pastry cream in a shallow pan, cover with plastic wrap and leave it to cool. Truffle flavoured caramel sauce: Prepare a dry caramel with sugar and glucose. Stop the cooking by adding boiling cream. Add half the truffle brunoise, set aside. Creamy vanilla ice-cream: Prepare the creamy vanilla ice-cream mix. Churn in an ice machine till frozen. Crispy tuile: Use a metal spatula to mash the banana on a marble work surface. Incorporate the flour. Spread the batter onto a greased silicone mat and bake in a preheated oven to 190-200˚C. Shape on a rolling pin while still hot. 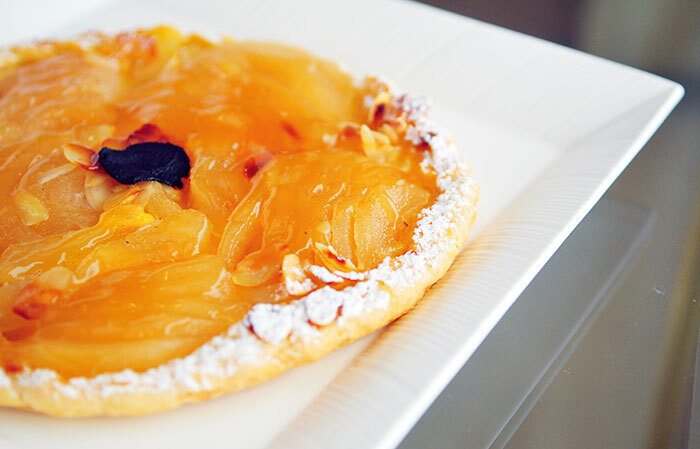 To serve: Spread a little pastry cream onto the pear shaped puff pastry, top with caramelised pear half. Place a quenelle of vanilla ice cream to one side and pour truffle flavoured caramel sauce onto the other. Place a crispy tuile above the pear and sprinkle with remaining truffle brunoise.